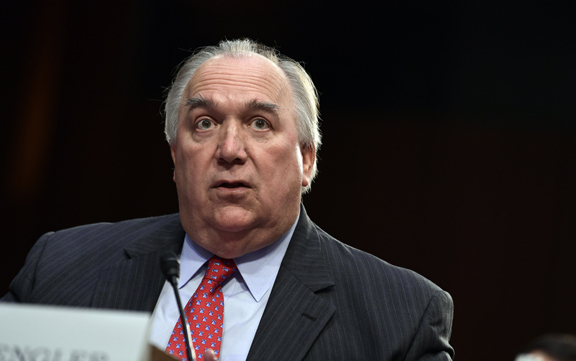 EAST LANSING (AP) — Michigan State University’s alumni magazine opted for a positive message after the original issue addressing the Larry Nassar sexual abuse scandal was scrapped by Interim President John Engler. The issue is the first since the former sports doctor was sentenced to decades in prison for abusing girls and women, including Michigan State athletes. The Spartan Magazine’s original front page was slated to be a black-and-white photo of a woman with teal lipstick. The color represents support for sexual assault survivors, and the issue’s contents would have been essays uncovering how the university handled Nassar’s case and what it now means to be a Spartan. Nine short letters from alumni and university deans line the pages of the magazine, some critical of how Michigan State handled Nassar’s sexual assault allegations. But the centerpiece of the new issue is a four-page Q&A with Engler, the Detroit Free Press reported. The rest of the 60-page magazine was filled with positive stories about events and programs taking place on campus. Several alumni criticized the updated issue, saying they want the magazine to reflect ongoing conversations, even if it’s not all positive. The magazine missed an opportunity to help alumni in their conversations about the Nassar scandal, said alumnus Mike Johnson. University spokeswoman Emily Guerrant said the magazine is trying to strike the right balance. The magazine’s three-month production process made it difficult for the editorial team to stay ahead of the news cycle, she said.